The power of wholefood extracts! Ultra Source of Life is based on the proven principles of the original Source of Life products by Nature's Plus. Vitamin K from vegetable sources (Phylloquinone). consists of spirulina, kelp, laminaria brown algae, Irish moss (cartilaginous lingua, red algae, bladderwrack, chlorella, Norwegian sea kelp, among other. contains enriched extracts of nutritionally important vegetables like broccoli, tomatoes, spinach, garlic, celery, alfalfa and others. made of glutathione, N-acetyl-cysteine, selenium and grape seed extract. Metabolism detoxifier, also contains glutathione. 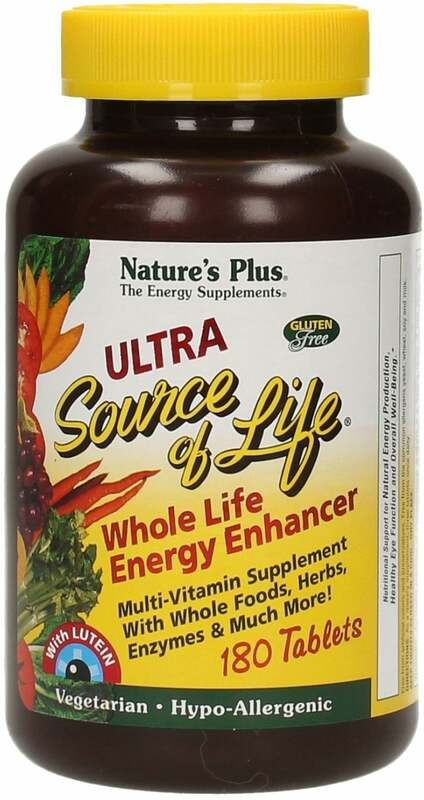 contain various herbal ingredients that have a high potential to inhibit plant-based radicals. It also contains antioxidants such as Chinese green tea with epigallocatechin gallate and extracts from grape seeds and turmeric. A high concentration of essential amino acids, like Spirulina, and the Whole Food Amino Acid Complex. The Source 70 - a wholefood based soluble mineral complex.